For many human residents and visitors of Jackson Hole, winter means adventure. Skiers flock to the slopes of Jackson Hole Mountain Resort, or ascend the peaks in Grand Teton National Park. Below the mountains cross country skiers and snowshoers head out to explore the Jackson Hole Valley. Snowmobiles carry visitors to Old Faithful in Yellowstone. At the end of the day everyone returns to comfortable lodging and rich food, insulated from winter’s grasp until we choose to go back out into it. It’s a far contrast from the lives of our wild winter residents who are out in the snow, all day every day. 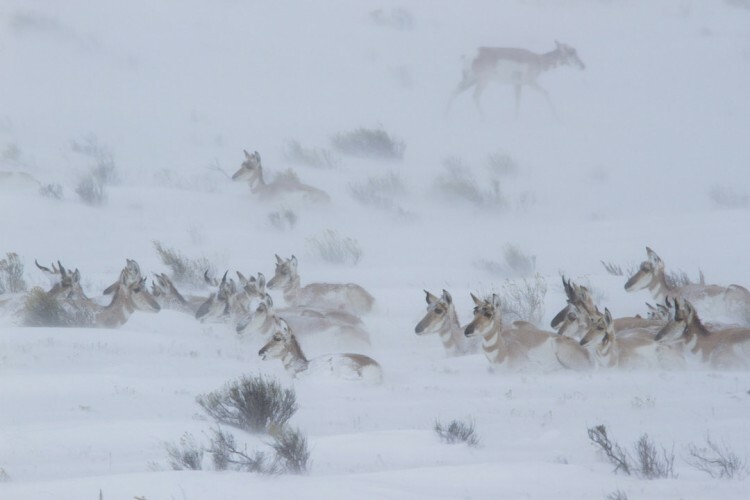 Most have also migrated to better habitat for the winter, areas which offer shelter from cold temperatures, extreme terrain, deep snow, and some forage. Here they will rely on fat deposits (up to 50 lbs of pure fat in elk!) to supplement the limited forage available, waiting out winter. Amazingly, females will also carry full term pregnancies during this time, preparing to bring the next generation into the world in spring. Habitat Protection Areas, (also known as winter wildlife closures) abound in the Jackson Hole Valley in winter, evidence of a commitment to conserving our irreplaceable wildlife by visitors and locals alike. Most are found in the Jackson Hole Valley, places like the Snake River bottom in Grand Teton National Park, and the open hillsides above the town of Jackson. These areas provide refuge for tens of thousands of wintering elk, mule deer, moose, bighorn sheep, and bison, now concentrated in the Jackson Hole Valley in greater numbers than any other time of year. Others are found high in the Teton Range, windswept mountaintops including the summits of Mount Hunt, Static Peak, and Prospector Mountain. Winter recreation is closed through April first to protect winter habitat for a small remnant population of bighorn sheep that endure rugged conditions. In the past, habitats like these remained protected by default, very few humans had interest in venturing into extreme winter environments. It’s a strategy that’s worked for centuries, but is now showing signs of strain. As the popularity of winter recreation continues to expand across the Greater Yellowstone Ecosystem it is up to us to recreate responsibly. Fortunately it isn’t very hard to help give wildlife a chance to endure in winter. By staying out of established Habitat Protection Areas we avoid stressing animals, helping them conserve those critical fat reserves they are relying on through late April. These areas represent a small fraction of the overall terrain available to human recreationists, a small sacrifice for the future of the Greater Yellowstone Ecosystem. You can learn more about habitat protection areas here, thanks to our friends the Greater Yellowstone Coalition for assisting with this post.